If you've never knitted before, watching an experienced knitter toss around terms like "slip knit pass" or create a dainty, lacy edging can be intimidating. But even advanced knitting is made up of the same basic units. The cast on to get the yarn on the needles in the first place, knit stitches which are flat on the side facing you and bumpy on the backside, purl stitches which are bumpy on the side facing you and flat on the side facing away, and casting off or binding off, which is how you get the yarn off the needles to finish the project. 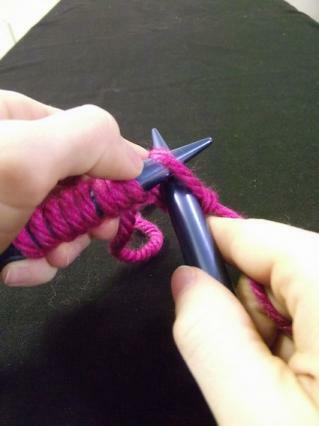 Although there are many ways of casting on (getting the yarn onto your knitting needles) the long-tailed cast-on is one of the most versatile. It's also very fast once you get the knack of it, and will continue to serve you well throughout the rest of your knitting career. Start by tying a slipknot near one end of the yarn, leaving at least a 24-inch tail. You're going to use both the tail and skein ends of the yarn to cast on, so the more stitches you're starting with, the longer the tail needs to be. Trial and error is the only way to be sure how long the tail needs to be. Err on the side of making it too long at first, because you can always cut the extra off without disturbing the rest of your project. 1. 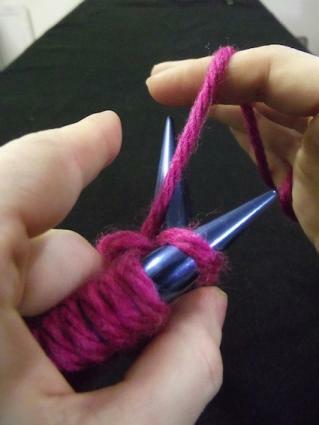 Use your right index finger to hold the slipknot in place on the knitting needle. 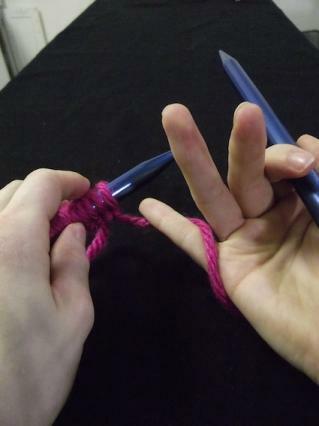 Wrap the ring and pinky fingers of your left hand around both dangling tails, then put the thumb and forefinger of your left hand in between the two tails. Spread your thumb and forefinger apart, as shown in the image. 2. 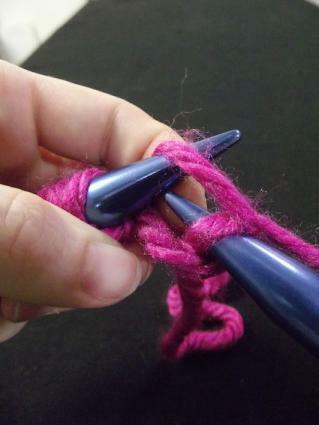 Continue holding the slipknot in place on the needle as you poke the end of the needle underneath the strand of yarn nearest to you -- the one that crosses the heel of your hand. Make sure the needle points away from your body, not toward it, as you do this. 4. 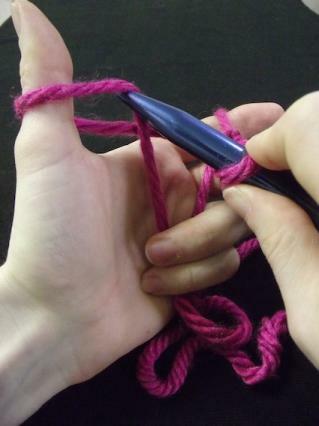 ...then pull that strand of yarn toward you, through the "window" made by the yarn wrapped around your thumb. 5. The end result should look something like this. 6 Gently snug both strands of yarn down on the knitting needle, so it's about as tight as the original slipknot. Then position your hands as for Step 1 again. Congratulations, you've just cast on your first stitch, and you're already positioned to start on the next one. Keep casting on stitches until it feels natural, or until your yarn tail runs out. 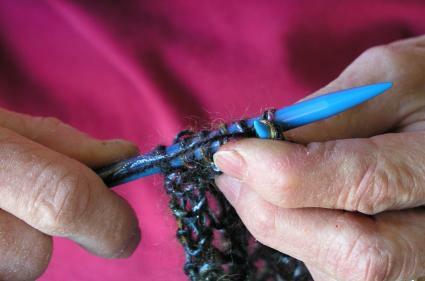 Once you've cast some stitches onto your needles, it's time to practice the knit stitch. 1. 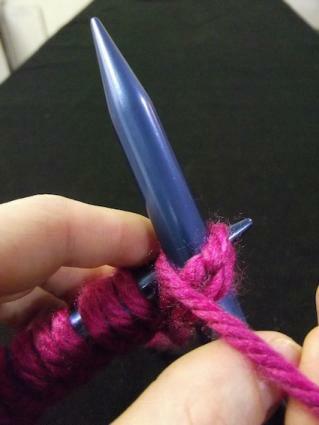 Switch the knitting needle with the cast-on stitches on it to your left hand. 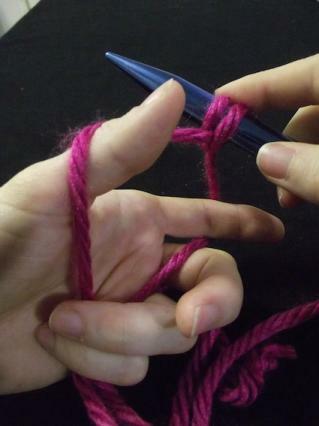 Let the tail end of the yarn dangle, and wrap the skein end loosely around the pinky finger of your right hand (as shown), to help you control the tension of the stitches as you knit. 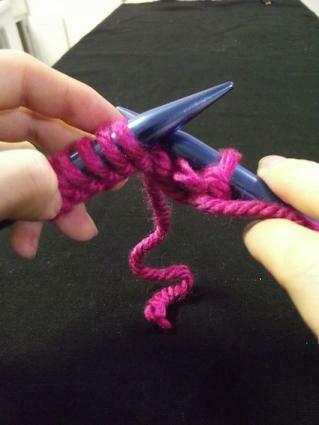 If you let the yarn just dangle loosely, the stitches would be so loose they'd slide right off your needles. 2. 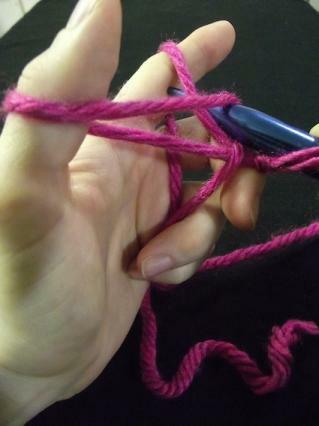 Turn your hand palm-down and run the yarn loosely over your index finger. This will help you control the yarn as you knit. 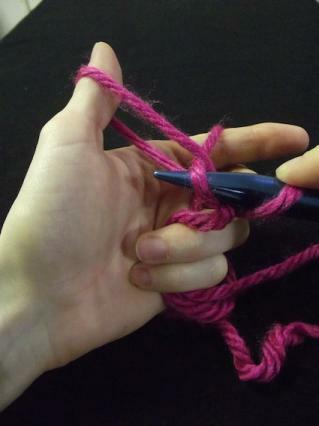 There are many ways of holding the yarn as you knit, this is just one of the easiest ways to start. 3. 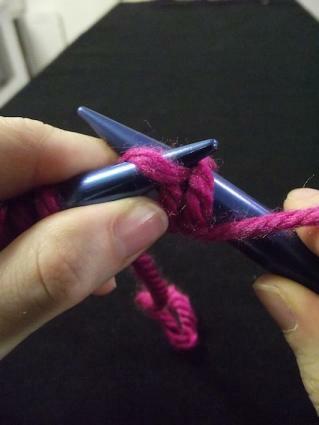 Poke the end of your right-hand needle through the first stitch on the left-hand needle. 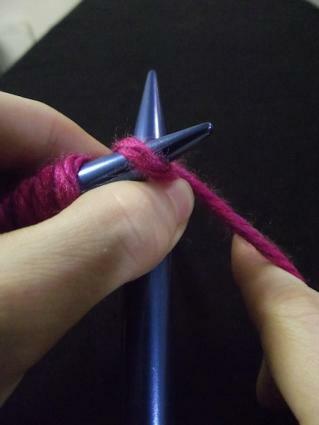 Make sure the right-hand needle points away from you, and sits below the left-hand needle, as shown. 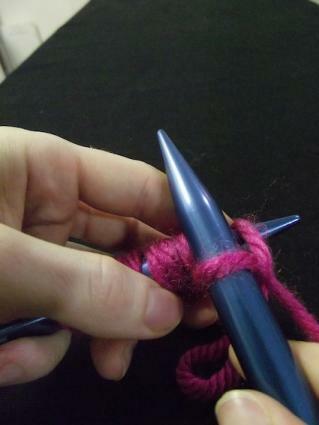 Also, note that you hold the skein end of the yarn behind the needles, not in front of them. 5. ...then brings it down between the two needles. 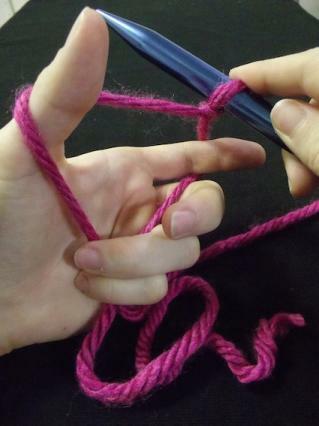 You just created a loop, or wrap, of yarn around your right-hand needle. 6. Bring that wrap of yarn toward you, through the stitch still on the left-hand needle. 8. So you're left with this. 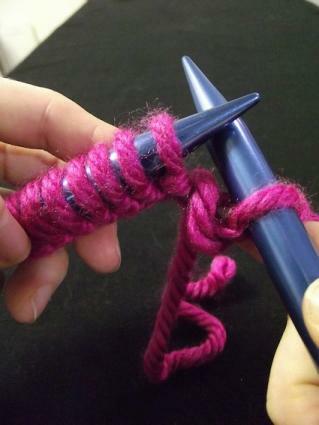 You're now ready to start knitting into the next stitch on your left-hand needle, beginning with Step 3. 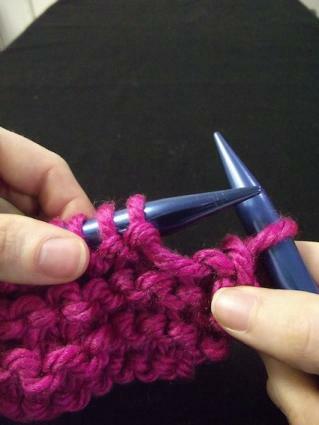 The companion stitch to the knit stitch is the purl stitch. 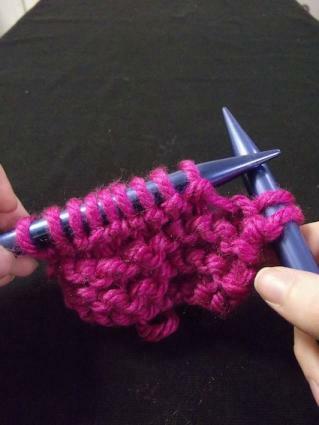 You can think of purl and knit as opposites, because they put the bumpy part of each stitch on opposite sides. 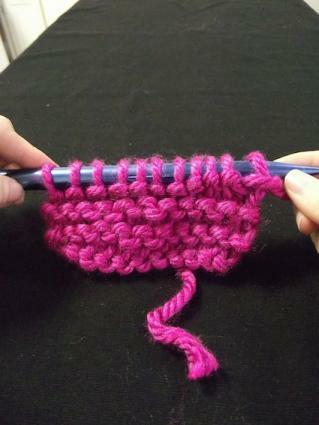 For the knit stitch, the bumpy part of the stitch lands in the back; for the purl stitch, it lands in the front. 1. 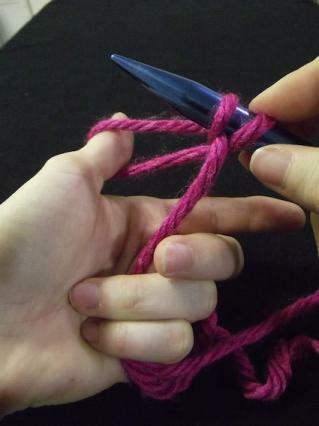 Hold the needles so your right-hand needle is behind the skein end of the yarn. 2. 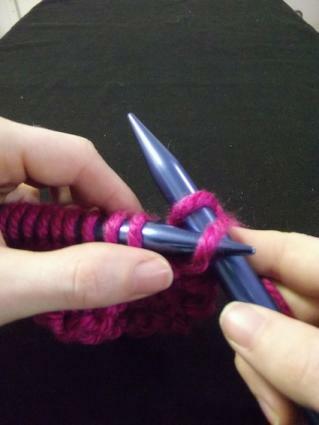 Poke your right-hand needle through the front of the first stitch on the other needle. Note how the right-hand needle points to the left, and lies on top of the left-hand needle instead of behind it. 3. 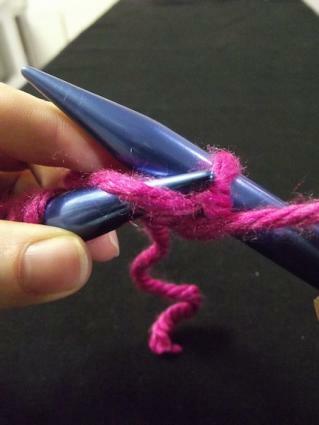 Wrap the yarn counter-clockwise around only the right-hand needle, as shown in the image. You now have the new purled stitch on your right-hand needle, while the stitch you just purled into is on both the right- and left-hand needles. 6. ...leaving just the new purl stitch on the right-hand needle. You've now purled your first stitch, and you're ready to set up for purling the next stitch by going back to Step 1 of this section. 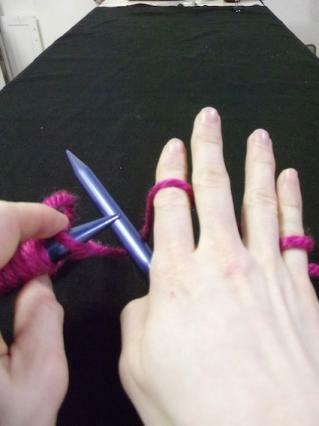 Remember, when you're purling stitches you should hold the yarn in front of your knitting needles. Once you've purled across an entire row, you turn your work, just as you did with the knit stitch. If you purl every row your knitted fabric will look the same as if you knitted every row. 1. Starting from a new row, knit two stitches. That means you end up with two knit stitches on your right-hand needle, and all the rest of the stitches are still on your left-hand needle. 3. ...and use that left-hand needle to carefully draw the lowermost stitch up and off the tip of the right-hand needle, letting it fall between the needles. This is how your end result should look -- note the extra loop around the base of the stitch still left on the right-hand needle. 4. Knit another stitch as usual, so you once again have two knit stitches on the right-hand needle, then start over from Step 2 to cast off the lowermost of those two stitches. 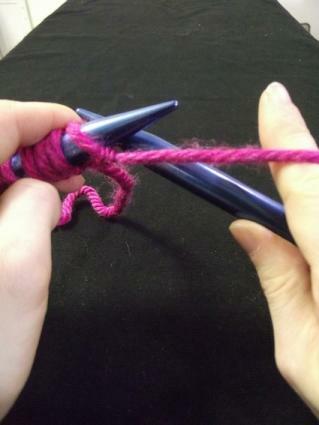 As you continue knitting one more stitch and then casting off the one below it, the closed end of the fabric will dangle off your needles as shown. 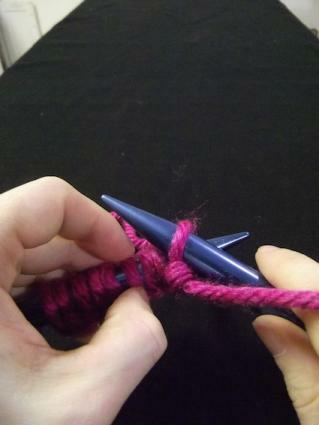 Once you've cast off every stitch you can, you'll have one stitch left on the right-hand needle and none on the left. Clip the yarn, leaving at least an 8-inch tail, and draw it through the remaining stitch. 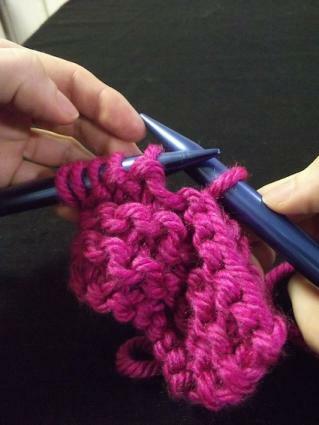 Pull the tail tight to secure that stitch, then use a yarn needle or a crochet hook to weave the tail end of the yarn in and out of the knitted fabric. This both hides the loose yarn and secures it, ensuring that your final stitch won't come undone. Once you've woven the loose tail into your fabric for a few inches, it should stay secure; clip any remaining excess yarn as close to your work as possible. Do the same thing with the tail end that's left from your original cast-on: Weave it into the fabric, then clip any remaining excess. Congratulations! You now know the essentials of knitting, and you're ready to move on to basic knitting projects. For your first basic project, try a knitted garter stitch washcloth: Cast on 20 stitches using a bulky-weight yarn, and knit every row until the washcloth is about 8 inches long. Bind off loosely, and finish as directed above.